All transactions are safe and secure with a reliable history in online purchasing behind each of our associates. Buy the Robin Symbol t-shirt to own Batman clothing and merchandise. 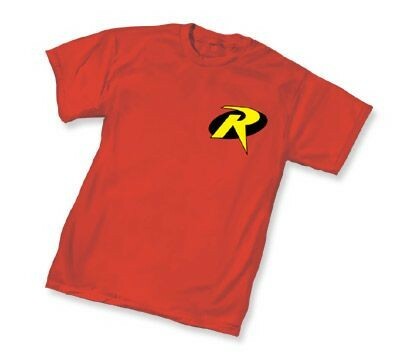 The front of this red tee displays the 'R' symbol from Robin's costume. The Boy Wonder was first introduced in 1940, roughly a year after Batman debuted. The purpose of the character was to draw in a younger audience. It worked and the two became known as the Dynamic Duo, taking on villains like the Joker, whose hauntingly happy white face hid the complexities of a formidable foe. Wear this Robin Symbol design to represent one half of the Caped Crusaders. Pair it with a Batman Dark Knight shirt or battle your friend in his Joker mask. In addition to the Robin Symbol tee above, browse the Batman Clothing Gallery for more apparel like men's and women's clothes, kids shirts or hoodies.